History.2 - The Guarded Hot Plate Method | Thermtest Inc.
Development of the guarded hot plate (GHP) apparatus started in the early 20th century, and was influenced by the Lees Disk method reported in 1898 by English scientist Lees. It is generally well accepted that the GHP apparatus was developed nearly concurrently in the United States and Germany. A request by the American Society of Refrigerating Engineers in 1910 to the National Bureau of Standards (NBS) was what sparked the development of the GHP apparatus in the United States. The request asked the NBS to provide standard data pertaining to heat transmission through insulating materials, which the society of engineers would use for design purposes. At the time, no precise method existed for the measurement of heat transmission through insulating materials, and thus scientist Hobart Cutler Dickinson set to work designing and building the first GHP in The United States. Around the same time in Germany, scientist Richard Poensgen independently developed his own GHP apparatus, which used the same experimental setup and theory as the GHP developed by Dickinson in America. Technically, Poensgen was the first inventor, as his apparatus had been in use since 1910 to measure the thermal conductivity of insulating materials, while Dickinson and the NBS didn’t start measuring thermal conductivity with their apparatus until 1912. The guarded hot plate apparatus uses a steady-state method in order to determine the thermal conductivity of an insulating material. Use of a steady-state method requires that the insulating material be in equilibrium with its surroundings in order for accurate thermal conductivity measurements to be obtained. The apparatus setup involves a heating plate (guarded on all lateral sides) sandwiched in between two samples (of the same dimensions) of the insulator to be measured. An unheated “cold plate” is then placed on either side of the insulating material, and after the testing, once the system has reached thermal equilibrium, the thermal conductivity is calculated from the temperature rise of the cold plates (which is representative of heat conduction through the insulating material). There are currently three standards in place by ASTM which apply to the guarded hot plate method: C177, C1043 and C1044. The standard that applies to a GHP apparatus will depend on the specific setup of that apparatus. 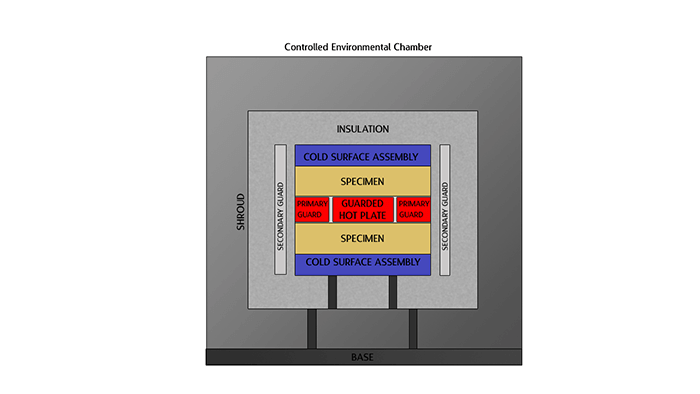 Shown below are two figures which illustrate the experimental setup for an early guarded hot plate apparatus. The GHP apparatus is still being produced and sold today, and this machine boasts the ability to measure samples of insulation materials in the temperature range from -160 °C to 250 °C with thermal conductivities up to 2 W/m*K.
Figure 1. Experimental setup for an early GHP apparatus. Figure 2. 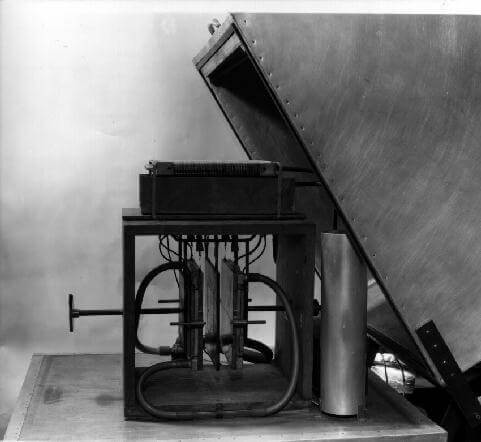 Photograph of the GHP apparatus used by the National Bureau of Standards from 1929 to 1983.